Pedro Ximinez is that syrupy dark sherry that smells of dried fruits, sun, and molasses-tinged caramel. 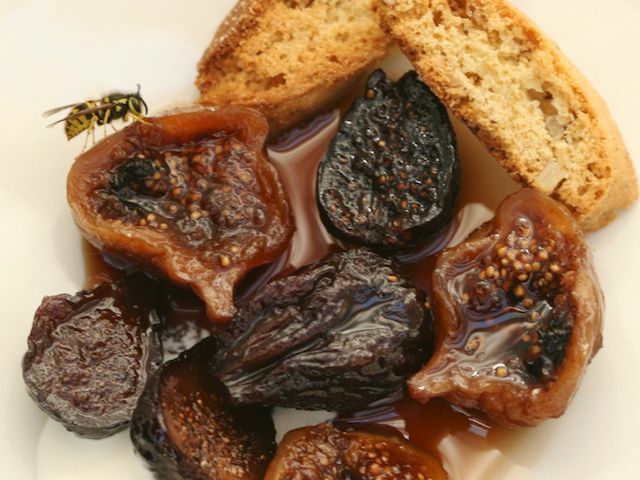 I cannot taste it without thinking figs, raisins, prunes, almonds — in general, fall, winter, and Spain. A Shiraz, however, is also a good choice. These figs are so intense you really can‘t eat more than a few, but they’re great to have on hand to serve with a mound of ricotta cheese or a spoonful of cold cream, or an exceptional yogurt and biscotti. Snip the stems off the figs. Put them in a small saucepan with the sherry, water (or water to cover), and honey. Bring to a boil, then lower the heat, cover the pan, and simmer until the figs are soft and succulent, 45 minutes to an hour. (Even though they’ll feel tender when you press one with a finger before that much time has passed, they do need to cook the full amount of time.) Turn off the heat and remove the figs to a serving dish, leaving the liquid behind. Cut a number of the figs in half to expose their seeds. Bring the poaching liquid to a boil and cook until bubbles cover the surface and the texture is syrupy when you tilt the pan, about 5 minutes. Pour the syrup over the figs, cover the dish, and let stand until you’re ready to serve them. Place a few figs in small bowls for each person and spoon a little cold cream around them.